“I just felt like running,” Forrest Gump. Most people who know Alex Hardin know he’s happiest when he’s running for fun and competitively. Alex Dean Hardin lives in Blue Rapids with his parents, Ron and Kim Hardin and younger sister, Sam. 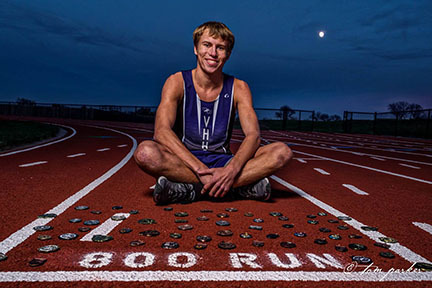 Alex has participated in many clubs and activities at Valley Heights including, cross country and track for four years, qualifying for state in cross country 4 years and two years in track. He has participated in basketball and FFA for three years, FCCLA, NHS, forensics, and scholar’s bowl for two years, and the All school Play, Art Club, and Peer Tutor for one year. Some of Alex’s greatest high school memories are running at the State Cross Country meet for the last time with his longtime friend, Adrian Pishny. Adrian has influenced him the most along with his parents because they both push Alex to do well in sports and are there for him through everything. Alex plans to run at Allen County Community College then attend Kansas State University to study Mechanical Engineering and Computer Science.